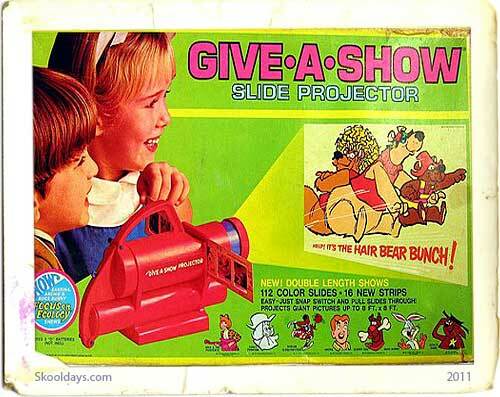 Remember Kenner’s Easy-Show Movie Projector? 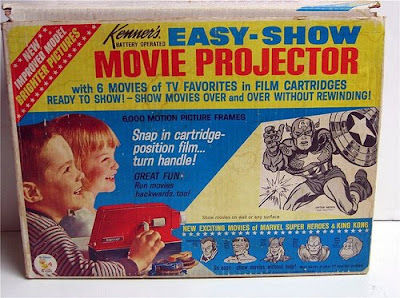 Back in the 60s and 70s, before video recorders and home video was unavailable, the only way you could watch cartoons in your schools broom cupboard on end of term day was with toys like Kenner’s Easy-Show Movie Projector, which used film loops so there was no film threading involved! This was great except there was always kids in and out the broom cupboard disturbing the light of the projector. It was brilliant in theory and rubbish in practice but my my my it was seriously nostalgic reminiscing on it now. There were several versions available by the 1970’s. It was one of those toys that look like hours of fun on the TV advert but when you had one, it never really felt right. The premise of the Kenner toy was fun enough. You bought the basic set which was a projector (glorified flashlight is more like it!) and 112 35mm slides. Well, that’s actually 16 cartoon strips with 7 pictures on each. The way it worked was to run the slides through the projector onto the wall and enjoy the equivalent of a 4 square foot illuminated comic strip. Like a lot of boomer toys, these projectors are fairly easy to find today and they are generally in working condition. Occasionally, the pin will be missing in the hinge of the handle but other than that, they made it through time in great shape. There is always a catch, though, and in this case, it’s the color slides. The slides are frequently scratched and warped. This entry was posted in Cartoon, Movies, PrimeTime, Toys and tagged 1960, 1970, 1980 by Skooldays. Bookmark the permalink. how can I get one!!!! retro/vintage toys are the best! these were around in the 80s too. i wanted one soooooo bad! you can find them on ebay. id like to get one. Are you aware of any Easy Show projectors that are for sale? I have 1 I would be willing to sell.